The Indie scene is awash with platformers trying to eek out a living besides the likes of Braid, VVVVVV, Super Meat Boy, and the other big wigs. 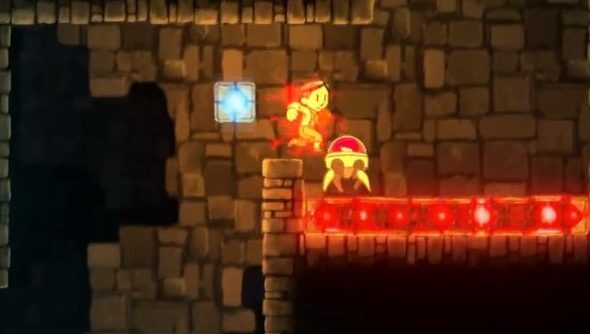 The latest to throw down its gauntlet step into the ring is Teslagrad, bringing with it its intriguing magnet mechanic: you can imbue objects with either a positive or negative charge, allowing you to turn blocks into floating platforms or crushing gates depending on the charge of the scenery. See for yourself below in some footage of the game in action. Eurogamer spotted this one (though, I like to think, deep down, that really they were just highlighting it so that we could write it up for you fine readers). Currently in development by Rain Games, Teslagrad is set in a Steampunk version of Europe, a Europe where Nikolai Tesla’s style of electricity creation took root over Eddison’s more stable methods.According to Teslagrad’s IndieDB page, you take control of “a strapping young lad” who’sexploring the Tesla Tower, a building housing the old Teslamancer Order. From Peter Wingaard Meldahl’s Youtube channel. It looks to be a fun little mechanic, though the puzzles themselves don’t seem to be particularly taxing. With a game of this ilk, it’s success really sits on its puzzles. Its main competitor is Braid, and whatever you think of the story, art style, or time-shifting mechanics in play there, it had good, taxing puzzles. Teslagrad is due out in January. Taken from Ryklost’s Youtube channel.